After just six months, 'Love Island' winners Dani Dyer and Jack Fincham have decided to call it quits. 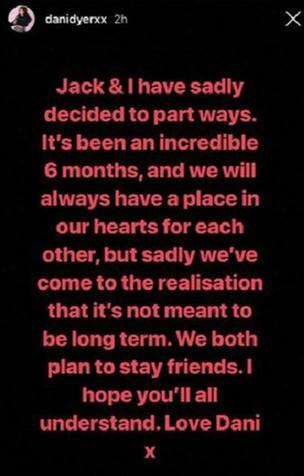 Dyer released a statement via her Instagram saying they had realised their relationship was "not meant to be long term" but that they "plan to stay friends". She also said they "will always have a place in our hearts for each other". Jack has yet to comment on the split. Jack and Dani were together for the entirety of the two-month 'Love Island' series last summer, and their relationship won over fans from the start. The couple quickly moved in together when the show ended and even got a puppy. They had also just finished filming a new reality series about their life together. This means that Megan and Wes, Josh and Kaz and even Adam and Zara have outlasted Jack and Dani. Who'd have thought it. We should all just take this on the chin. Relationships end. They were only young! Now excuse us while we go somewhere and sob uncontrollably because love is dead.